As the Huawei P20 Pro shows, Huawei is no longer here to simply make up the numbers. It's ready to go toe-to-toe with the very best in the smartphone world. It doesn't come cheap, but as the year has gone on its price has dropped, putting it below the most expensive flagships out there – the likes of the Samsung Galaxy S9 Plus and the iPhone XS (though it's worth noting they're more powerful too). Even with the more powerful Huawei Mate 20 Pro following it, the P20 Pro remains one of our favorite phones of the year – and that's after a serious amount of time spent using it. There are some quirks to the Huawei design and software to get used to, but the remarkable work done on the camera makes this one of the most versatile phone photo-shooters out there, whether you're a happy snapper or an amateur enthusiast photographer. The Huawei P20 Pro price at launch was £799, AU$1,099 (around $1,050). A few months on from launch, we've seen it approaching £600 in the UK, no doubt due in part to the launch of the Mate 20 Pro. That means it's well worth shopping around to see what kind of deal you can get on the P20 Pro. The hardware might be slightly older, but as the price drops it becomes better and better value: check out our dedicated Huawei P20 Pro deals page to make sure you get it at its cheapest. The P20 Pro didn't arrive in the US immediately, and it's still not officially available with a local variant. You can still pick up the international variant of the handset though for around $750 on the likes of Amazon, but you'll need to check whether it's compatible with your carrier. If you're interested in the Huawei P20 Pro, there's a good chance it’s because of the camera array. There are three cameras on the back, one 40MP main sensor, a 20MP black and white one and a 3x zoom 8MP camera. Other parts of the phone are a little more conventional. We get the Kirin 970 CPU used in the Huawei Mate 10, 6GB of RAM and 128GB of storage. Note that the Mate 20 Pro has since appeared boasting the Kirin 980 CPU. Huawei has clearly tried very hard with this phone. The result is a mobile more interesting than the Samsung Galaxy S9 or S9 Plus, particularly if you're going to make use of all the camera's high-end features. 'Shiny' is the word that sums up the Huawei P20 Pro's design best. Yes, it's big. Yes, it has a notch. But sheer reflective spangliness makes this phone stand out. It's two big plates of rounded-off Gorilla Glass with a filling of metal finishing off its sides. This metal is aluminium, but it has a polished rather than anodized finish, and looks more like steel. Unlike the stainless steel iPhone X though, a month into using the P20 Pro, the frame is scratch-free, boding well for the phone's durability. For the most part you'll probably see the black and blue versions of the Huawei P20 Pro sold in the UK, but there's also the more eye-catching gradient version. Purple at the top turns smoothly to a greenish-turquoise at the bottom, the sort of finish you see more often on a supercar than a phone. However, the Samsung does a slightly better job of appearing to be 'all screen' front-on, because the Huawei's screen does not curve around at the sides. Only the glass does, and just the last millimeter or so at that. 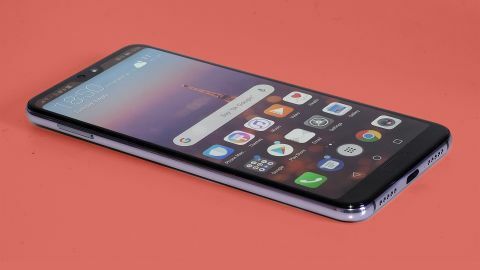 The Huawei P20 Pro – along with the standard Huawei P20 – was the first but not the last Huawei phone with a notch, the display cut-out made famous by the iPhone X.
Apple's excuse for the notch is it is required for all the tech used for the phone's face unlock feature: a normal camera, an IR camera, a dot projector, a proximity sensor and more. Huawei doesn't have quite as good an excuse, as there's just a high-res camera and speaker on the Huawei P20 Pro's front. However, the notch is smaller. Notches may end up being a Crocs-grade "what were we thinking" move in hindsight, but they seem to be in fashion for now. You'll most likely forget the notch is there after a couple of days, particularly as when watching standard 16:9 video there are black bars where the notch sits anyway. Huawei has also followed another recent trend, as the Huawei P20 Pro doesn't have a headphone jack. You get a USB-C to 3.5mm adaptor in the box, or you can use wireless headphones. We would, obviously, prefer a real jack. The phone is water resistant to IP67, meaning it can handle submersion in one meter of fresh water for 30 minutes... but don't start dunking it for fun. There's a fingerprint scanner below the Huawei P20 Pro's display and, like those of every recent higher-end Huawei, it's extremely fast. It takes you to the home screen in a heartbeat. You don’t even need to press the power button to make Face Unlock work. While there's no proximity sensor to tell when your face is in front of the screen, the Huawei P20 Pro's gyroscope senses when the phone has been picked up, or taken out of your pocket. It then immediately starts scanning for your face. As Huawei's phones still don't have the innate desirability of a Samsung or Apple, raw outer hardware was never going to be the top selling point of the Huawei P20 Pro. However, Huawei has done well here: the phone feels and looks expensive, and about as slim and light as we could hope for given its screen size. The numbers sound unusual, but this is really just a Full HD screen stretched out to an 18.7:9 aspect ratio. That's right, it's even 'wider' (or longer) than most other 18:9 screen phones. Pixel density of 408ppi isn't even close to the 529ppi of the Samsung Galaxy S9 Plus. The only time you're likely to notice though is when using a phone-based VR headset – and if that fad isn't dead, it is at least dormant. Okay, if you look close you can see slight evidence of the PenTile fizz that affects Samsung OLEDs that don't have insane pixel density. This is caused by Samsung OLED's pixels sharing sub-pixels, reducing perceived resolution a bit. The Huawei P20 Pro’s display quality is excellent though. Blacks are perfect, and there's minimal blue cast when the phone is tilted, which affects some less advanced OLED displays. The Huawei P20 Pro also has a few more unusual tweaks. Its display can change the color temperature on the fly to suit ambient light conditions, and the top part of the screen can be blacked out to completely hide the notch. This looks particularly neat as this little area can still be used for notification icons when blacked out. Also worth noting, the P20 Pro ships with a pre-fitted screen protector, giving it the best chance of avoiding scratches possible. That said, this plastic film does attract fingerprints pretty readily, so you may want to swap it for a tempered glass screen protector down the line.